Samsunghyeol, located in the heart of the old Jeju city, is frequented by many tourists coming from other cities in early May. 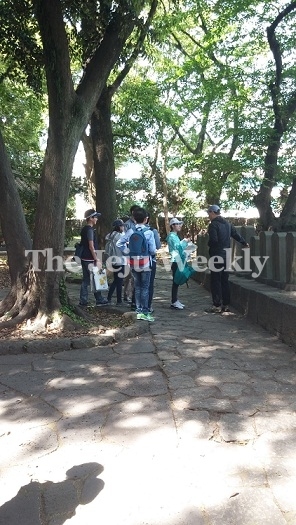 Most of the tourists visited Samsunghyeol because it is in close proximity to their hotel. Samsunghyeol is the place, according to legend, where the Jeju’s culture started. Mr.Ko, Mr.Bu, and Mr.Yang came from the large three holes. That holes are called, “Samsunghyeol”. Then, three princesses from the east brought farm animals and crops. The three men and the three princesses married each other and made Tamra, which is now Jeju. A woman visitor nicknamed ‘Beauty Lady’ said, “I felt fresh when I come to this place. This place has a lot of tall tree and it covers the sun so it is not so hot. Also, the air is very different from Seoul where I live. Its air is more fresh than Seoul’s air. Samsunghyeol is the cool place that the visitors can visit. Jeju can be a free international city with the help of places like Samsunghyeol. The great natural resources of it attracts people from other cities and other countries.